It could not have been scripted any better. Champion mare Winx bowed out in the most fitting of styles at her beloved Randwick racetrack yesterday, winning her third Group 1 Queen Elizabeth Stakes (2000m) and bringing up a magical 100 Group 1 victories for her trainer Chris Waller. It was to be the perfect send off – her 33rd consecutive victory and 37th overall to equal the great Phar Lap. She is now the highest prizemoney earner of all time and retires as the world’s best racehorse of the modern era. While the number 13 may be unlucky for some, April 13 has been fortuitous for two greats of the Australian Turf, with Winx’s swansong coming exactly six years to the day since the great Black Caviar signed off with her 25th and final career victory in the Group 1 T J Smith Stakes (1200m) at the same venue. Quite simply, yesterday was a piece of theatre that even the most gifted of playwrights would be happy to lay claim to. As a sea of blue engulfed every confine of Randwick’s grounds, Winx remained as quiet as a church mouse in the preliminaries, completely unfazed by the grandeur of the occasion. Down at the start, Sky Racing cameras unearthed a truly special racing moment, where those for whom tickets proved elusive were seen lining the streets that surround the course, noses pressed up to the gate that separated them from racing immortality. Then it was all down to Winx and Hugh Bowman. 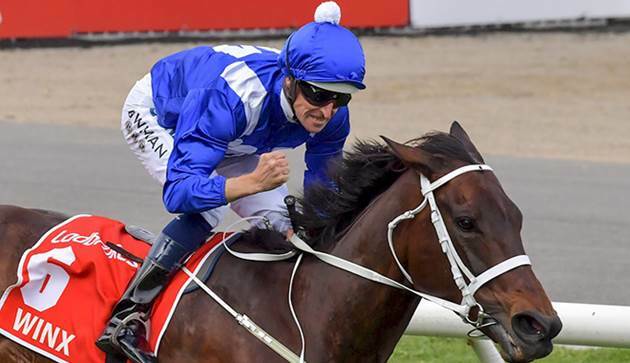 The pair left the barriers for the final time and the customary hold-up tactics were employed, Winx settling just worse than midfield as Mask Of Time set the early fractions. In a carbon copy of her other 19 Randwick victories, Winx swept around the outside of the field approaching the turn for home, Bowman leaving nothing to chance as the seven-year-old began to move through the gears. Having conceded significant ground to the Japanese entrant Kluger, who scraped the paint up the inner, the champion briefly afforded that horse a head start before surging down the outside, her adoring fans in full voice as she powered to the line with seemingly any amount in hand. 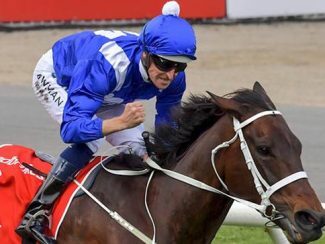 With Kluger sticking on well for second, it was Winx’s old adversary Hartnell who fared best of the rest in third, four lengths adrift of the great mare as she crossed the line for the final time in a glittering 43-start career at typically-prohibitive odds of $1.06. Race caller Darren Flindell was tasked with the immediate reaction, urging viewers to “remember forever how you feel right now” before crossing over to an emotional Debbie Kepitis. “This is a fairytale ending, we weren’t sure if we’d get that,” co-owner Kepitis told Sky Racing, lumps aplenty in her throat. “How wonderful was that girl? She’s the most amazing, supreme athlete that I think I’ve ever seen, handled by the most supreme coach. Waller, trying hard to keep his emotions in check, cut his usual self-deprecating figure. “It’s hard to explain without getting too emotional. She’s just an amazing horse for everybody to be part of and I’m a small cog in the wheel,” he said. “My team just do an amazing job and it’s rare they get the accolades they deserve. I’m sure people will see it through a horse like this, racing for four years at the very best, it’s indescribable. When asked if there could have been a better way to bring up his 100th Group 1 win as a trainer, Waller could barely muster the vocal strength to respond with a simple ‘no’. Fellow co-owner Peter Tighe, so often the calm and level-headed member of the team, was another who understandably succumbed to the emotion of the occasion. “Chris came and led her in with us which was a super touch as he’s the captain of the team. She’d probably love to go round again,” he said. “She’s just amazing. What she has done for people, for racing, everything. We love her to bits. But in truth, the most poignant of messages was delivered by Hugh Bowman, whose ice-cool demeanour will forever be associated with Winx’s incredible career. “It’s going to be nice to have my life back,” he joked, before exuding his customary class in an emotionally-charged post-race interview alongside his wife Christine. “Having a young family, and such a supportive family at that, has kept everything very real for me. Having children certainly keeps everything in perspective, especially young children. “The last 12 months there’s been a few things in our lives that have also kept things in perspective. Our good friend Pat Smullen was diagnosed with pancreatic cancer about 18 months ago. He’s in a good place at the moment but I have known three of four other friends who have died from the disease since then. He continued: “I’m so glad that Tye Angland could make it here today. He used to sit beside me at Warwick Farm and I think so much about him. For me, that’s where I get the strength from. Angland, a former top jockey in his own right, was left paralyzed after a race fall last year. “To be in the position to ride such a great horse is a great privilege, and I feel the emotion, but at the end of the day she’s just a horse,” Bowman added. Bred by John Camilleri’s Fairway Thoroughbreds, Winx (by Street Cry) was a $230,000 purchase at the 2013 Magic Millions Gold Coast yearling sale from the Coolmore Stud draft. She ends her career with 43 starts for 37 wins and a prizemoney total of $A26,451,175. Winx is one of seven foals out of dual-stakes winner Vegas Showgirl (by Al Akbar), who is presently in foal to Japanese sire-sensation Deep Impact. She is also the dam of 2016 Group 3 Kindergarten Stakes (1100m) winner El Divino (by Snitzel) and the unraced Boulder City (by Snitzel), who stood his first season at Riverbank Farm in Victoria last year.